Hello Linux Geeksters. As you may know, Converseen is an open-source multi-platform image converter and resizer, written in C++ and using the Qt4 libraries. It has support for more that 100 image formats, including like DPX, EXR, GIF, JPEG, JPEG-2000, PhotoCD, PNG, Postscript, SVG, TIFF and many others. It offers the user the basic photo manipulation functions, including convert, resize, rotate or flip. The latest version available is Converseen 0.7.1 which comes some fixes for the settings dialog, and a bunch of bug-fixes as well. 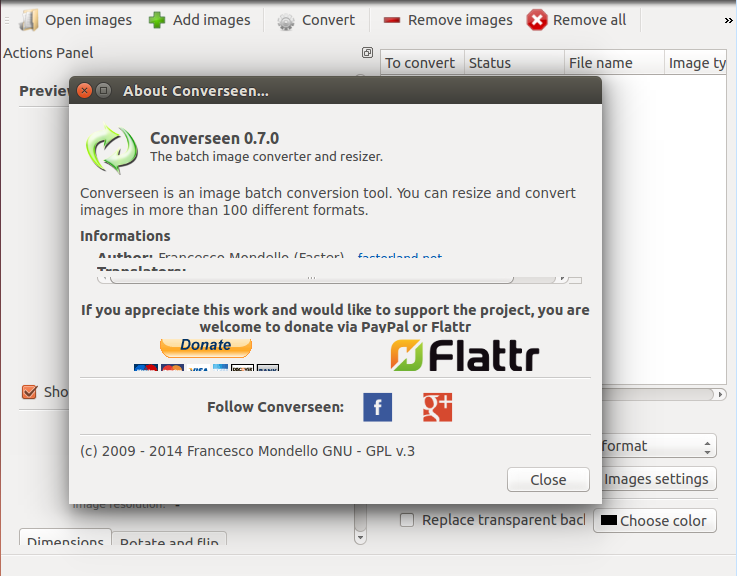 In this article I will show you how to install Converseen 0.7.1 on Ubuntu 14.04 Trusty Tahr, Ubuntu 13.10 Saucy Salamander, Ubuntu 12.10 Quantal Quetzal, Ubuntu 12.04 Precise Pangolin, Pinguy OS 14.04, Pinguy OS 12.04, Linux Mint 17 Qiana, Linux Mint 16 Petra, Linux Mint 14 Nadia, Linux Mint 13 Maya, Elementary OS 0.3 Isis and Elementary OS 0.2 Luna.